Fourth of July is quickly approaching so I figure it’s finally time to share my favorite recipe for deviled eggs. The reason I’ve never shared it before is that I’ve never had a recipe written down. I usually just add the ingredients bit by bit until it tastes right. But this morning I decided to actually measure things as I went and now I can give you a recipe that somewhat replicates my standard deviled eggs. So, what’s so special about my deviled eggs? Absolutely nothing. Just like my egg salad, I prefer my deviled eggs free of any additions. I don’t add anything sweet, I don’t add anything crunchy, I don’t even add anything spicy. And I never, ever, ever add any chopped onion. My eggs are universally appealing because no one has ever bitten into one of my eggs and encountered an ingredient they weren’t expecting. But these eggs aren’t bland or boring. I think they are a bit tangier than the average deviled egg and that’s what keeps people coming back for more. The last time I made deviled eggs, the darn things were almost gone before I managed to make my way over to the plate! From now on, I’ll be sure to stash a couple extra in the fridge to ensure that doesn’t happen again. And who says deviled eggs are just for parties and barbecues? I think they’re great anytime! Sometimes I’ll just make one or two for a snack. See that photo up there? I ate a couple of those eggs for breakfast this morning. And this one down below? I just ate that one, too. You might have noticed that I pipe the filling into my eggs using a pastry bag and decorating tip rather than just spooning it in. It’s not because I’m trying to be fancy. Trust me, I’m not fancy. But over the years I’ve figured out that if I fill the eggs using a pastry bag, I don’t run out of filling as quickly. When I use a spoon, I usually put too much filling in each egg, then run out before I’ve filled them all. Using the pastry bag, I end up filling every single egg and then have a bit left over to squeeze on my finger (or directly into my mouth if no one’s watching). It’s up to you. If you have some disposable pastry bags and a decorating tip that is suitable for the job, go ahead and pipe that filling into the eggs. If not, just use a spoon but try not to overfill them! Mixture may be piped into the eggs using a pastry bag instead of using a spoon. Recipe can easily be doubled. I always make my deviled eggs with Best Foods Mayonnaise (aka Hellmans) and just regular yellow mustard. If you don't have white wine vinegar, just use your favorite kind or whatever you have on hand. If you don't have smoked paprika, just use plain paprika. I suggest that after the first time you make these, don't bother with the recipe and just add things to taste like I normally do-- it's more fun and then you don't have to clean the measuring cup and spoons! Oooh I've had those! (and they were goood) Did you use your light at all in these photos? awesome! i plan on making devilled eggs for canada day and this recipe looks pretty much perfect! I'm firmly in the no-onion camp too, but I do like a bit of something spicy, like warm Aleppo pepper, in my deviled eggs. Whoever brings deviled eggs is always the hit of the party! Wow, beautiful photos. I type this with one finger over my lips trying to quell the urp-reflex because deviled eggs are so not my dish.. this should only give my compliment more merit, though. Lovely soft light that's just perfect for this subject. Emon: Well I'll keep an eye on your blog then. I bet Emonome turns into a food blog in no time! Quinn: The fact that you aren't a fan of deviled eggs makes your compliment that much more meaningful. Thanks! Nicole- your photos are amazing; I am getting hungry just looking at them. I have to say that I totally agree with you- deviled eggs don't need anything fancy or crunchy in them at all, the classic plain ones are always the best. 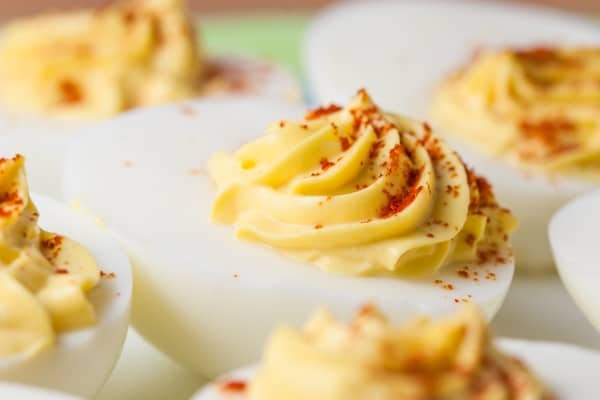 Great simple deviled egg recipe and what a mouth watering photo! Wow. I haven't had these since forever. Devilled eggs are not so common in Australia but I used to eat very similar eggs in Ukraine where I grew up. My mum did however add sauteed onions. We would add part of the mayo in the egg mix and the rest as dollops on the top of the eggs. I think I'll have to make them for my next dinner party or a bbq. this is how i make mine, i use white balsamic vinegar. Simple is perfect. these look beautuful! Sometimes simplicity is the best...I will be making some of these babies next weekend for my honey's b-day. Lovely pictures! Nice job on this recipe. Devilled eggs do indeed make a nice snack, especially during the hot summer months. Sometimes I do a variation & work a little remoulade sauce into the yolk mixture. Then I serve it as a devilled egg remoulade as a side with some broiled fish. a bientot! I eat deviled eggs for breakfast all the time! Glad to see I'm not the only one. Great black and white photos too. These look really pretty! The piping bags make them proper party finger food! So funny . . . I have deviled eggs on the menu for Fourth of July chez Huber. Only, and this flies in the face of your purist take so forgive me, I'm going to try mixing the yolks with a bit of curry and quinoa. I'm also in the no-sweet-or-crunchy-additives camp, but I recently discovered that using a pinch of truffle-infused salt is fabulous in deviled eggs... it's inexpensive but so luxurious.Thanks for all the great posts! I was looking for a simple deviled egg recipe, and yours is fabulous--the kids loved it! I had to laugh when I saw the Egg in a Nests--we grew up on those and the favorite part was the little piece of toast cut out of the middle, and fried separately. Love your website and can't wait to get more recipes! How on earth do you get all the little lumps out?? I have to beat them with an electric mixer to get them smooth, and they still don't look as nice as yours! Try running your egg yolks through a potato ricer...works great for me and there's no lumps! Rather than use a bowl and a piping bag, I make mine in a plastic bag (cider vinegar is my choice), snip a corner of the bag and fill. Not as pretty, but a huge time saver when you're making enough for a crowd. i lovee me some deviled eggs. i eat 'em morning,lunch anddd night time. I find you guy's dedication to deviled eggs, amazing. I pretty much get on this website everyday just to see the new updates. in fact,im making deviled eggs at this very moment. oops,i think there done..hold on. dot dot dot ohh,there not done,false alarm. ANYWAYS,do you guys ever have false alarms,when you think your eggs are done.. and they lie to you because there really not done. and i yell at them, " YOUR NOT DONE!LIER!" but they dont listen to me. i guess its just me or something because they listen to my friends. no one understands me. Amazing picture! They look delicious! in case you don't have piping bags: at a recent party, our hostess said that she simply used a sandwich bag and cut a hole in one corner in order to fill her yummy deviled eggs. genius! Grace: If you put the deviled eggs directly in the fridge, they should last for two or three days. But if they sit out on the counter for a while, like at a party, the leftover eggs shouldn't be kept because the mayonnaise could spoil. Hi Martha, so glad you liked the eggs! I didn't use a food processor, just mashed the yolks well with a fork before adding the other ingredients and then continued mixing with the fork or a small whisk until it's fairly smooth. For the lighting in the egg photo, I used this Lowel EGO tabletop fluorescent light. I learned about the light from Jaden at http://steamykitchen.com and it's a pretty good substitute for natural light if you are trying to shoot during a time when you don't have good light. I still prefer to use natural light when I can but it's nice to have a good substitute if I'm trying to take a photo at night or in a different part of the house that doesn't have good light. I went to a Halloween dinner party last night and brought twenty of these deviled eggs, and they were so satisfying. This recipe is awesome. This was my first time making deviled eggs. You were right to keep it simple. I didn't have a pastry bag or white wine vinegar, so I improvised. i used a zip lock baggy, and substituted balsamic vinegar. The smoked paprika really is a nice finishing touch. Thank you! These were way too boring and just to basic. I usually crumble bacon and use a little ranch dressing and dill relish in mine and everyone seems to love them. One person called them, "dream eggs". Sometimes a shrimp on top, caviar or a black olive is a nice compliment. Just a note on the pastry bag...I don't ever have those around, but I always have a ziplock bag around. I mix it all up, cut off a corner of the bag and squeeze it into the eggs. It doesn't look quite as pretty, but is much easier than using a spoon. Another thing I do when I have to take them to a potluck is leave the filling in the bag and pack up the egg whites, paprika and my serving tray and fill them when it is time to put them out. This helps me avoid getting squished eggs that look horrible by the time they are set out to be served. My husband just used your recipe for a company potluck. He had gotten some bacon salt from some place on-line and used that instead of the paprika on top. They were delicious! Best deviled eggs I've ever had! I use your recipe all the time for the holidays. They are always a hit and there are never any left overs. I now do multiple batches one to serve and one for myself. This recipie was FABULOUS! I made them for the Family and they LOVED them. THANKS SOOOOOOO MUCH!!!!!!! To center your yokes stir the eggs until they set and you will have nice strong whites. Sometimes I put horseradish in the yokes. I couldn't stand it after reading all these comments at 3:30 am I was making deviled eggs. They were so good!!! I just found your site yesterday and am having a blast comparing recipes. I also like a simple deviled egg but with kids sometimes a little sweet or a little tang will go a long way. Try substituting miracle whip for the mayo and honey mustard for the mustard (leave out the vinegar). Its a bit sweet and tangy without being overly complicated. The kids really enjoy them and they are still super easy. Looks great can't wait to try it...I'll let u know what the mr. Thinks of it...perfect snacks for easter! Another 'purist' who is not fussed over any lumpy stuff in my DE's. :-) Only changes from this recipe is that I put a touch of curry powder in and use mustard powder rather than bottled mustard, and another touch of butter. No vinegar in mine. DE's are indeed yummy! Deviled eggs are one of the world's most perfect foods. Do you have any tips on how to peel the shells from the eggs once they've been boiled? I've had the best luck using old eggs (the air bubble between the white and the shell gets larger over time). But I still manage to ruin a few! Any tips? I LOVE Deviled Eggs! Always have to restrain myself from taking too many when I go to gatherings or no one else would get any. I usually don't measure either, and I normally add WAY more mustard than most people. Your addition of vinegar sounds interesting. I might try it and see how it is. Thanks for posting. Why do simple recipes always have to have that one item not on hand ( SMOKED paprilka ) please! Oh, these were scrumptious . . . I may or may not be guilty of eating half of them in one sitting all by myself. (Shhhhhhhh! )Does anybody have a blasted terrible time actually producing properly cooked hard boiled eggs? It took two tries this time around to get eggs not too runny. I just made these tonight but added a sprinkle of white pepper. Amazing. It has that mild creeping heat. The white pepper was not enough for anyone to really pay attention but just enough for a little kick. These are very similar to my grandmother's deviled eggs. Except she didn't use the vinegar. She used just the juice from the relish jar. Gives the sweetness of the relish without adding any texture to the eggs. Of course, she just mixed it to taste -- she never used a recipe for anything. Now maybe I can make some that taste like hers. Thanks for the recipe! I love deviled eggs and have just discovered smoked paprika. I added garlic white wine vinegar and it was delish. Thank you so much for a great blog! I agree completely on keeping deviled eggs simple. Not only do additions overpower the flavor and texture of the eggs, in my opinion, it's what I grew up with, which seems to be the overwhelming reason why most people prefer their own recipe, and which explains why your recipe is "universally appealing." 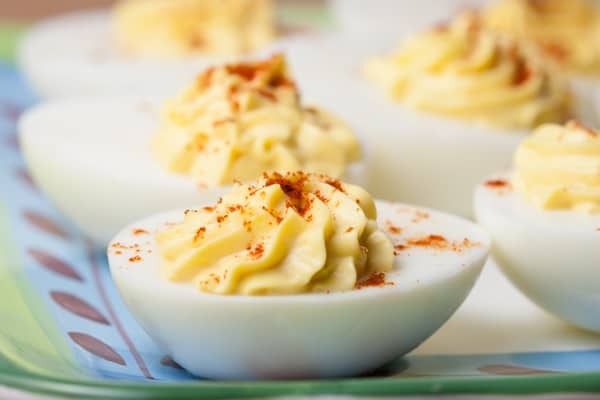 In my extended family, the recipe is even more basic than yours: Miracle Whip or mayo, salt, pepper, maybe a bit of garlic powder, and that's it.I was shocked yesterday, after more than four decades of making and eating many deviled eggs, to discover that many people add mustard to them. I'm from Mississippi, grew up in Florida, and have lived in Texas for many years, and have never tasted one with mustard in them, or even heard of it. How odd! 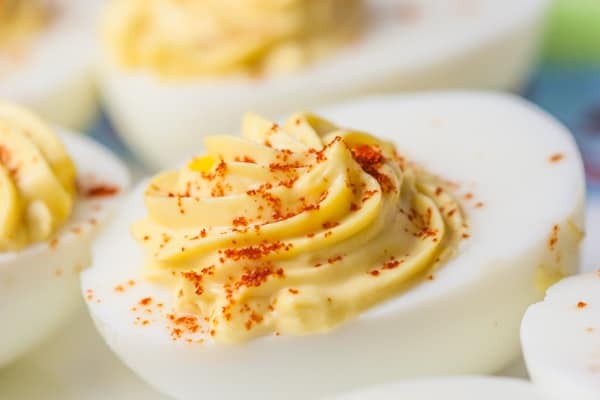 My mother-in-law, from the Midwest, puts paprika on hers, but I think it detracts from the flavor.As for peeling the eggs easily, I used to hate peeling eggs until I read Heloise's Hint when I was a teenager. Place eggs in cold water, bring to a boil, cover, turn off heat, let set for fifteen minutes. Then drain hot water, vigorously shake eggs to crack shells, immediately run cold water over them, and peel right away in the cold water. The shells slide off. Your egg fotos look delicious I made them using your recipe and it turned out wonderful. I love to cook but usually the recipes are to sweet and I guess I just found a site where i can make food using great recipes. Just wanted to say thanks for the super easy recipe. Somehow, even after YEARS of helping mom make Thanksgiving dinner, somehow,my eggs never turn out quite as perfect as her's. In my research for this recipe, I DID stumble on a neat little garnishign trick I am going to use and I just wanted to share... Instead of sprinkling the paprika over the finished egg, sprinkle it BEFORE the yolks have been piped in (P.S. I totally use a Ziploc sandwich bag - easier getting in the bag and no mess afterward when I throw the bag out)! Super smart - and I am TOTALLY going to do that this year. Thanks again for the simply awesome recipe! I used farm fresh eggs, so the yolk is most of the time off to the very side of the egg making it 'difficult' not to rip the lining. (I think It makes it taste better though) :) Thanks for the Recipe!!!!!!! 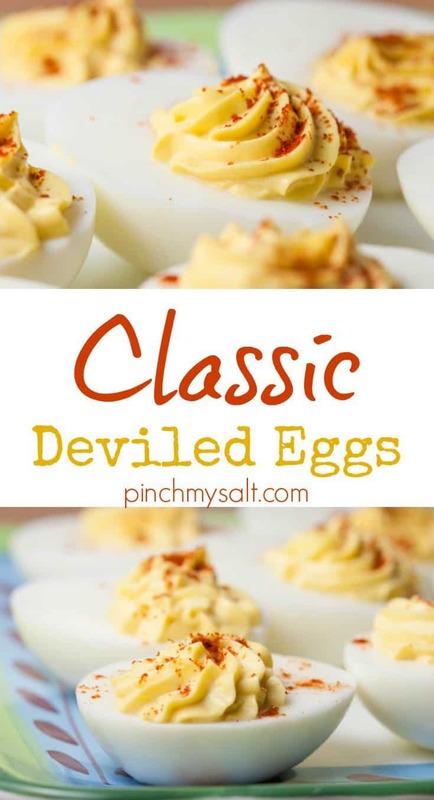 Mmmm, these look delicious...I LOVE deviled eggs and they are so simple. I too have been known to eat half of a batch in one sitting...A great way to quickly and easily peel boiled eggs is a trick my dad taught me. Once they are cooked, run them under cold water then simply roll the eggs one at a time on a table or counter with your hand to crack the shell (like you would rolling a piece of dough between your hand ad the table). Don't press to hard just light pressure, enough to cause the shell to crack but not enough to squish the egg. This makes the entire shell come off in one piece. I usually do it over an old plastic bag so i just have to tie it up and toss it in the trash for simple cleanup. Hi, yOur recipe is fantastic. I just made 'brain recipe' deviled eggs and it turned out as the ugliest thing in the world. Yours look even, pretty and 'organized'. PS : HAPPY NEW YEAR !! I always put it a tsp. of dill pickle juice instead of the vinegar. This depends on if you prefer them to be a little tart or if you prefer sweeter eggs use sweet pickle juice. Just don't over-do it or the yolks will get runny. Better too little than to much. My 97 yr. old aunt can eat 6 of these with no problem. Oh this recipe is classic! I love deviled eggs and sometimes try to experiment. For example Herb stuffed eggs (with garlic and herb cheese spread and green onions) like these http://cookiteasy.net/recipe/herb-stuffed-eggs-6797.html may diversify a little the basic dish! Thanks for your recipes! They are so delicious! I know this was posted a long time ago, but I just have to add to the comments. I love deviled eggs but hate onions and celery, so plain and vinegary is my favorite. Lo and behold, I tried this recipe and discovered this is the key to getting my boyfriend to do anything I want. I had no idea he would love them so much! And now that I've discovered you can BAKE your eggs instead of boiling, I make these all the time! I don't have a pastry bag, so I just spoon my yolk mixture into a ziploc sandwich bag with one bottom corner cut off. Works great, just not as pretty! Yes, these are good. My MIL makes potato salad with boiled red potatos, hard boiled eggs, mayo and a bit of mustard and salt. No onions pickles nothing. It's delicious! i want this Deviled Eggs is my breakfast and i really enjoy it. great job thank you. This was the first time I tried the pastry bag. How fast and decorative. We are certainly going to enjoy deviled eggs more often. I also have discovered how easy cooking the eggs in the pressure cooker is. Yes, using a pastry bag makes it look great, but it's also super fast and not as messy and trying to fill with a spoon. I love cooking my eggs in the pressure cooker! The shells come off perfectly every single time! It's how you boil your egg. Heat water to boiling, drop eggs in and boil for 14 min. Bring to sink and fill with ice. When cool enough to handle, shells come right off. The recipe was a great classic taste! The mixture was a bit thick so I added some pickle juice and it was perfect. Also added finely chopped bacon and topped with cayenne instead of paprika. Would make a great egg salad as well. A great recipe for a classic deviled egg. My husband is a huge fan of deviled eggs and he requested some without anything crazy. I'm known for trying to jazz everything up (even if it should be left alone). Well, this was amazing! Perfectly tangy and absolutely delish.